Despite ample photographic evidence, there are still folks out there who don't believe Beyonce Knowles-Carter is pregnant with twins. Your auntie is convinced beyond a doubt that she is pregnant. But some people are having a hard time forgetting Beyonce's deceptive ways. In 2012, rumors ran rampant that Beyonce hired a surrogate to carry daughter Blue Ivy, now 5. Beyonce's camp vigorously denied the rumors. Then all hail broke loose when she sat down for an interview, and her baby bump folded in half. They say if she did it once, she will do it again. Okay, even after looking at the pics on your site as well as others of Beyonce's so-called pregnancy, I'm probably the only skeptic out there still unconvinced she is pregnant this time and I was never convinced she was pregnant the last time after stomach deflate gate. I never ever go onto Beyonce's website. I'm not a fan of hers so there never is a reason to. But yesterday I did go on her website to look at the pictures she posted and that photo has photoshop written all over it. I'm I the only one that noticed her belly is lighter than the rest of her body with that white chalkish look? White chalk is a clear sign of inexperienced photoshop. I've also seen pictures after Beyonce has performed and seen her perform on TV and she has dark knees like most people. Look at the photoshop pregnancy pictures and there are no dark knees. Where'd they go? If you look closely at these preggo pics it looks like someone inserted that belly onto her regular stomach. If you look just above the belly button you see a line just below her breast bone that goes across her stomach which appears to be the point where the bump is inserted. Most women's bellies get darker with pregnancy not white and chalkish looking. And most women get a line across the center of their stomach or just below the belly button. A woman has to be a serial head case to pull a fake pregnancy stunt rather than woman up and have a national conversation about the real issues some women face who are unable to conceive. It's not a scarlet letter on a woman's forehead if she can't conceive on her own or can't carry a child to full term. It's nothing to be ashamed of. I just don't get the fakery with her. So basically, this site is now Beyonce Rose. Got it. Beyonce is paying blogs and interns to rave about her big belly. What more do people want? No matter how detailed the photo was people would say it was photoshopped/fake. Whomever wrote that those long arse paragraphs about the authenticity of another woman's womb, needs to get a phucking job and a few personal goals. Bey needs to set up a pussccee cam in the delivery room so all the skeptics can see the twins actually exiting the womb.................and they STILL WOULDNT BELIEVE her, they would say its a fake pussccee. Sheeshh ? I can't look at this stuff everywhere everyday, a joke here and there is cool but I don't like constant hate for no reason...time for a break from the Internets...? enough with bey preg news, its tiring and boring!! djt renamed Black History Month to "National African American Month"...he said the term "Black" is outdated. I am so sick of this already and it's only been 1.5 weeks. Matthew McConaughey said we should give djt a chance, man how am I going to like him anymore after this statement, wasn't he in "A Time To Kill"??? You need somethin to do! What kinda sick person would have their 5 year old kissing a fake belly! That was enough to convince me it was real! Enough is enough! Stars have the money to do what they want, they can have the egg fertilized and implanted in their womb. There is no reason to go to the lengths of faking. What is so hard to believe about getting pregnant? People have been doing it since the beginning of time. Hell I've been pregnant a few times without trying. Why is this so hard to believe? Your auntie is convinced beyond a doubt that she is pregnant. She pretends to be so in tuned with the black community while trying to get them to vote for a left wing nut job that won a eugenicist's award who hates black people and opened PPH to have black people exterminated. Will this pregnant stripper ever use her money to open up businesses that hires the very same black people she pretends to care about? Nope! She'll continue to sell them out and blame the white man for what she and Jayz are guilty of. Learn how to sing with out computer enhancement technology so that you wont have to rely on publicity stunts. You not a fan but bish ya wrote an entire essay on her belly ... LET HER BEE . ???? I'm convinced... convinced I'm witnessing a nervous breakdown being live-blogged. YES @ the eugenics comment!!! Margaret motherfuck*ng Sanger, Killary's idol. The left pays their Hollywood puppets well to dumb down their audiences. But why they gotta have the implant, can't they just fugg? MLK Jr. also accepted an award from Sanger. Please stop being stupid. It's been Black History Month, it's gonna stay Black History Month. Drumpf can kick rocks into that wall that'll never be built. IMO the jury is still out. I love me some Beyonce, but the whole fiasco with BIC kinda has me wondering. But really, who cares? She can have her babies any way she wants. I'm just glad that BIC won't grow up without siblings. But, if SR really believes she's pregnant, then most likely she is. Are you aware the sound people can use computer enhancement technology live through microphones? Idk , I know she used her money to build homes in Houston & I know she gave a milky to BLM but you could be right . Everybody hate strippers. While I don't have the time or the inclination to debate whether or not Beyoncé is pregnant, I do admire the reader's attention to detail and analytical ability. Are you aware that I and MANY people have heard her live without a mic???? If you look right above her belly button directly down from her left nostril, horizontal to her right ear and perpendicular to her pinky toe, while saying supercalifragilisticexpialidocious three times backwards, while drinking lemonade that was stirred with a bat and contains 5 pieces Blue umbilical cord and 6 strands of Jay's pubic hair.......you will still not see the line that MOST women get down their belly....CAUSE SHE ISN'T THAT FAR ALONG!! Why do people care so much about her uterus? You don't have to take care of these kids so what does it matter? I dont hate anyone for how they survive but at this point she has milked the minds of impressionable young black girl's and their wallets - She Can Put her Clothes on now. Are you aware that she's still over rated? Try real singers like Leontyne Price and let go of the oversexed hoodrat artist being peddled to you. Maybe they can't use their uterus and it is uterus envy or they want her to be unable to use hers to justify them not being able to. IONO, but it is beyond dumb at this point. Folks don't even review their medical plans this closely!! She has to do something to save face after her failed endorsement of a candidate that believes black people should be sterilized and slowly exterminated. She had a miscarriage before maybe she just wanted to protect Blue .. idk but it seems that most moms are Linda care free with the 2nd child .. I really doubt if she cares who tf believes or doesn't believe she is pregnant. Bey hardly ever comments on shyt...she just keeps it moving. People who still have doubts...trust me when I tell you she aint paying ya'll no mind. I realize that, but why are people assuming Beyonce can't get pregnant the natural way? Idk...maybe people think she's too vain to go thru pregnancy as it might ruin her figure? I had a woman say that to me when I told her I wanted another baby...I was like ???? This movie must be called The resurrection of the Aborted Plant Parent Hood Babies a.k.a Beyonce's Stans. dont be fooled. she can pay for any prosthetics! 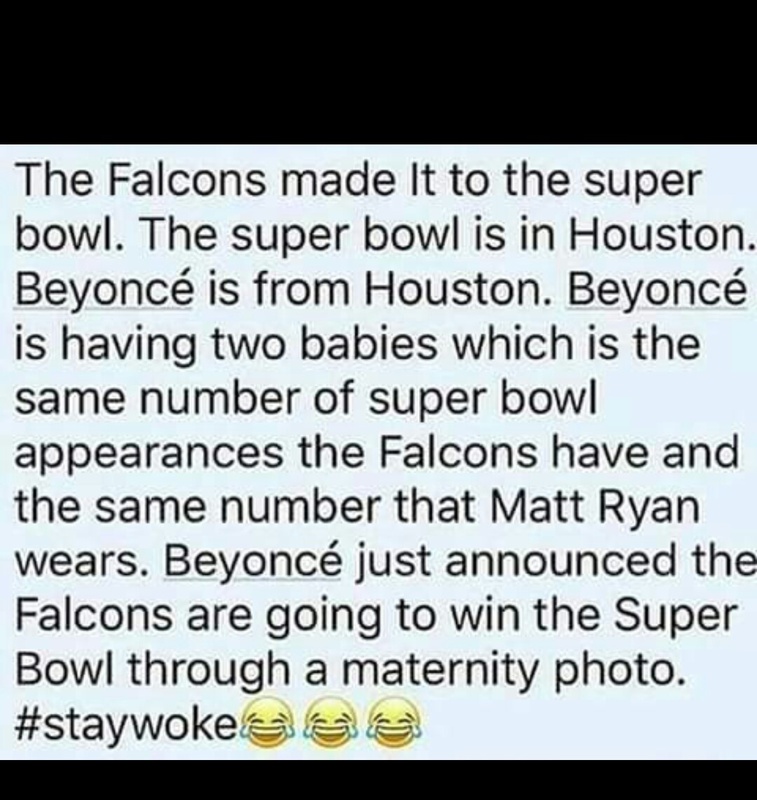 Bey and got shyt to do with the Falcons ... Jesus ??? People get big mad about how others choose to handle things. Free will, personal choice, prerogative; "You name it"! Fertility or lack thereof is a touchy subject. smdh...why do folks even care how Beyonce' chooses to have a baby? It's between her & husband Jay Z, is what I'm saying!! Pray for her to have a healthy child, that would be the noble thing to do. js. The writer is upset about this BUT I wonder if she listens to R. Kelly? Here we go with this chit again. Yall leave this woman's hoo-ha alone! It's a good look for her! Because jealousy and misery are real. Is that weave in Blue Cheese's head?! I hope her twins are boys because Blue narrowly escaped those prickly branches on her father's ugly-tree. Boys can get away with a less than stellar face. ? So today Auntie believe she prego and had believed, and yesterday auntie said she not.... So yesterday news article you posted about her faking the pregnancy didn't happen right???? Agreed. Let her build her family in piece. It's not like they neglecting they child they currently have, so why is everyone so concerned about her having more children and how, what, and when they got or come here. Her skin looks uneven: STOP BLEACHING, B! That twin pic killed me LMFAO!! Lmao!!! 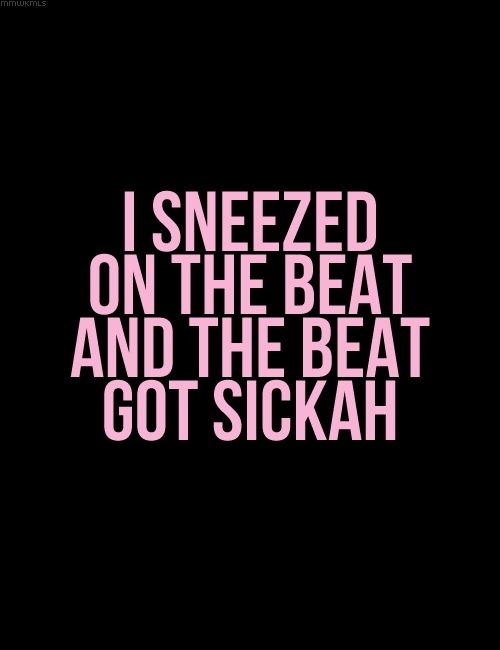 @ the little Jay Z"s.
Sassy black girls love to argue. I never said you didnt know any other artist. 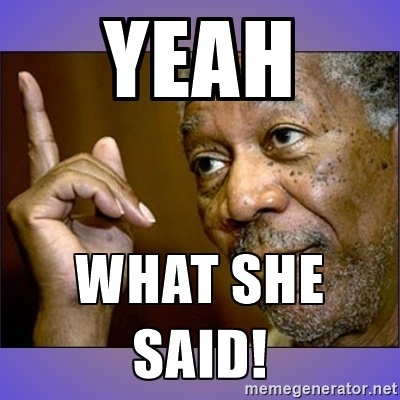 Stop being so sassy about everything and quit hating on interracial relationships ( ex:Kanye West) in your other comments to me- You are insecure. You can't be that ignorant, or can you? 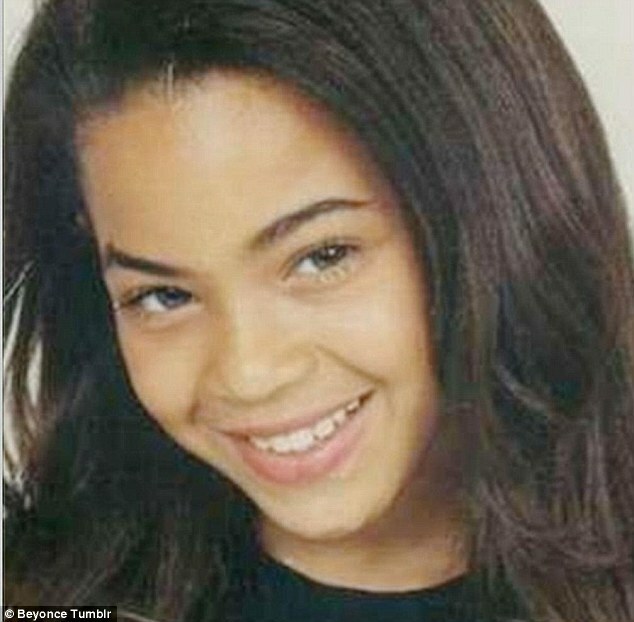 Beyonce has been a light skinned from birth, so please girl, save it. SMH. This person is claiming Beyonce might be a serial nut case, but took the time to write THREE whole paragraph, about what might or might not be in HER stomach. 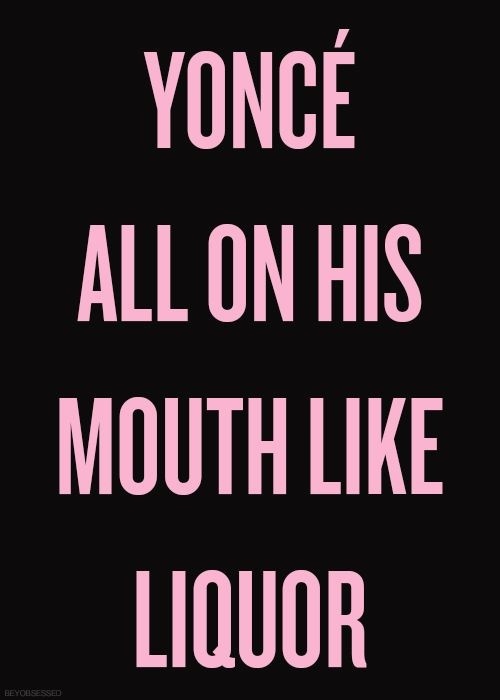 This say's a whole lot more about your mental state than Beyonce. Lesigh. Why are folks so obsessed with this woman's womb? If for some stupid weird reason she's faking her pregnancy, it's her body and her business. Congrats to her on her first pregnancy. Your convinced yesterday you said her picture was photoshopped!! Which is it? Not everyone is interested in carnal minded things. No she has not. All babies are light for their first year or two. Peep Beyonce in her DS/Crazy in Love days. She was dark brown. Beyonce is doing this for her fans. Not so much the naysayers. Lmao trying to throw jabs at Beyonce being a nut when you're so focused on if she's pregnant or not lmaooo. Taking that time to write that long azz hatergraph. My knees and elbows are black as hell but my breasts and stomach are pale compared to the rest of my body. In case you didn't know, many black people are two toned or even have multiple tones. Our skin is highly susceptible to becoming uneven because of varying degrees of exposure or just over pigmentation I'm some places. I've never used bleach but my skin is various shades of brown. Beyonce Matthew made all the girls tan. She was way past two yrs old here. This is definitely DARK BROWN lol. Beyonce has never been dark brown. She sometimes wears bronzer or is tanned to a caramel brown but never a dark brown. I really just have one question though. Why is it that she never gets that black line of birth on her stomach that most black women get when they are pregnant? It normally travels upward the further you get. It's called a tan, and bronzer. Look at her pictures when she was an adolescent. Besides, i'm light skinned myself, and was the exact complexion as a child. My complexion changes depending on the season, or whether I tan or not. 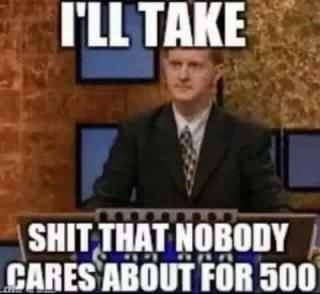 "Rumors ran rampant" talking about yourself in 3rd person. ?? and.....that bottom pic. *sigh* Congrats again to Beyoncé. Oh....the loyal reader is a huge Beyoncé fan and has way too much free time. Right?!! Lol! I'm a fan and she knows more about Bey than me. I just don't be focusing on no ones knees. That's a bit much. I actually have two kids i.e. two pregnancies and I had the faintest line both times. Infact since the line is always there even when not pregnant the right explanation would be that my line never got darker, it just stayed the same. We are after all uniquely and wonderfully made. Exactly. And wow, @ your friend lol..girl. Exactly she didn't carry blue that's y ppl have a hard time believing this time but I don't care if she's pregnant with my mom she's an attention whore and I would hope people would focus on their own lives this much! Trump Presidency is a joke to a lot of people. Beyonce is probably saying "Might as well"
Beyonce will still be at the Grammy's I heard. Also performing at Coachella. Which pregnant woman will perform in Coachella in front of teenagers?? Is it really important? no mother flaunts the first pregnancy after a miscarriage. I had a friend who didn't show anything until her baby was born bc she lost 3 babies before then at the 6-8mo mark so she said absolutely NOTHING. why get hopes up if you think you keep losing your kids anyway. Nothing more beautiful than a black woman when she is pregnant! Blue Cheese....??? yea she got some hair added cause her hair isn't that long. She does spray and tan, I read it in an interview in the past. That's some hellified scrutinizing she did there. She has more time than me. I wish Bey nothing but good, other than that, her being pregnant is pretty unremarkable .....unless her belly folds again.....on national television. I KNOW a woman who refused to have children for this very reason. I respect anyone's decision to procreate or nah, but her reasoning put her in a whole nother light for me. Her tongue looks caked with plaque. People are just mean when it comes to Beyonce. She is pregnant at 35. Great! And she is having twins, fantastic! I think people who keep criticizing her are miserable and desperate and not happy and thet can't appreciate something great happening to someone great!!! True, with her everything is perceived as a conspiracy theory or in a negative light. I breast fed all of mine. No, my breast are not the envy of ANY woman, but my children didn't catch a cold until they started school. Um duh ?, there is a surrogate around the corner carrying her twins. These pics are fake and to throw y'all off. When I was pregnant I had a light line and my stomach was not dark. People r reaching, at the end of the day she has nothing to prove to any of us. I believe she's pregnant this time. Beyoncé must've had some fertility issues. Jay Z said she miscarried before. With twins though, I believe she and JZ did IVF with their own eggs and sperm. They were probably trying to get preggers for a while the traditional way. Even if she used a surrogate the last time you can tell she carried Beyoncé and JZ's child. She looks just like them both. I believe this is why Beyoncé released all those pregnancy pictures because of the rumors the first time. I believe Janet Jackson used the same method. Isn't medical technology great?!!! No stretch marks on her belly or thighs wow! Her belly looks like a kardashian booty sitting on pole legs. Oh well I must be reaching. How she performed and walked in high heels pregnant with Blu was a miracle. I onced leaned over to pic up something I dropped and toppled all the way over on the ground while 6 months pregnant. I know no one that wears high heels pregnant. Queen "Mary" Bey needs more people. I don't believe she's breeding either. That's nothing but a prosthetic baby bump. Guess she took notes from Kim Whordashian, make it look realistic you can fool the masses. I think either Blu Cantrell (again) or Kelly Rowland is the surrogate/donor. Those baby pics of Jay is actually adorable!